Forever Luck slot is part of the hit series featuring Money Burst Progressives, offering 4 progressive jackpots and up to 100 free spins. The theme here is based on traditional China, a theme that WMS seem to really like and is clearly quite popular. The machine itself isn’t one of the flashiest, but clearly displays all the information you need and provides nice warm colours with a great sound system. Up top is a small display showcasing what the slot is, while at the bottom you have your basic controls to operate the slot. The game also features the Money Burst Progressive symbol which serves as the Wild, meaning it substitutes for all the above symbols when part of a winning combination. Additionally, during each spin, columns 3, 4 and 5 may switch to an alternate reel. This reel does not contain 10, Jack, Queen, King, Ace, Owl or Toad. At least 1 alternate reel is guaranteed each spin. Progressive Feature. As well as serving as a Wild, The Money Burst Progressive symbol can also trigger the Progressive Feature with 8 or more of them on the screen, with each changing to a Lantern or Diamond symbol. The Diamond symbol only appears during the Progressive Feature, with only 2-8 available, serving as a Wild for all symbols apart from Money Burst Progressive and Flower symbol. 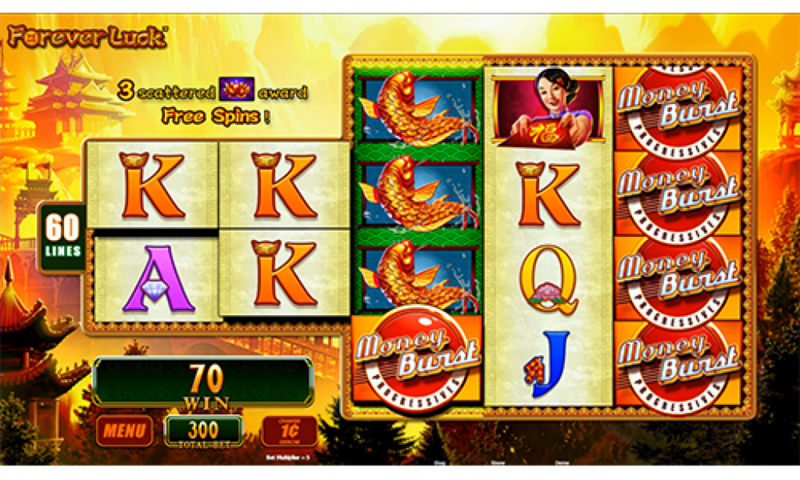 The Lantern on the other hand only appears during this feature and the Free Spins Bonus, serving as a Wild for all symbols apart from the Money Burst Progressive, Flower and Diamond symbols. 5 Diamonds will award the Mini Progressive, 6 the Minor Progressive, 7 the Major Progressive and 8 the Maxi Progressive. If the feature was triggered by 14 or more Money Burst Progressive symbols, the Mini Progressive is unavailable, while 15 or more render both the Mini and Minor Progressives unavailable. The chance of winning a progressive increases with your bets. Free Spins Bonus. 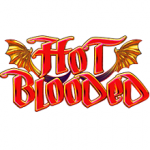 The other main bonus feature of the game can award you with up to 100 free spins. This can be triggered in various ways leading to different numbers of spins. Triggered by reels 1A, 1B, 2A and 2B containing 4 matching symbols and 3 scattered flowers on reels 3, 4 and 5. This will award a wheel spin providing 2-100 free spins. During each spin, up to 2 columns from columns 3-5 will switch to an alternate reels set, which doesn’t contain symbols from 10 up to the Owl and Toad (in value). The symbols on columns 1 and 2 during base game are locked into these positions throughout the bonus. Additional spins will be awarded for 3 scattered flowers, providing another spin of the wheel. Triggered by reels 1A, 1B, 2A and 2B containing 4 matching symbols. 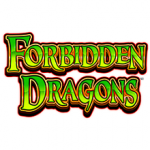 This provides 5 free spins, with the same rules as above for each free spin. 3 scattered flowers will award between 5 and 20 free additional spins. 3 scattered flowers on reels 3, 4 and 5. A wheel spin is provided, offering 5-20 free spins. During each spin, 2 or 3 adjacent columns from columns 3-5 will combine to form an oversized reel with large symbols that act as 2×2 or even 3×3 clumps of symbols. These reels use a different set of reels which don’t feature symbols from 10 up to Owl and Toad, or Flower. 1 scattered flower on reels 3, 4 or 5 during this bonus will grant another wheel spin. Forever Luck: Money Burst Progressive slot offers some very high rewards, although can leave you waiting for some time before anything comes in. 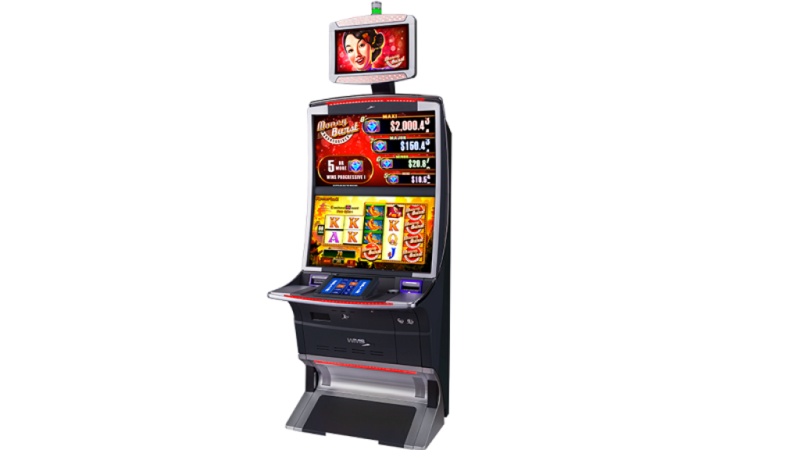 The slot itself is well designed, with 2 great bonus features to aim for and some big jackpots up for grabs. While the Free Games Bonus initially looks complicated, it’s easy to grasp and potentially very rewarding. Overall, a nice change from some of the more standard slots that I think many will enjoy.